My earliest memory of trying to doing something to absolute perfection was a time that I was asked to clean my bedroom at the age of 7. I began excitedly, eager to bring the room to a brilliant shine. I loved the feeling of being in a freshly cleaned space, complete with crisp new linens and the smell of the outdoors coming through my wide open windows. I was always so happy when my mom had cleaned my room. My body was joyful in a clean, clear space. My mind was calm, clear and uncluttered. Occasionally, she re-arranged the furniture and I was excited by the new-ness of the space. My entire being felt spacious and was giggly with happiness. 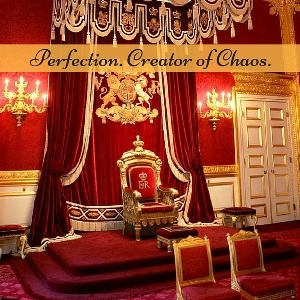 As I dusted and replaced items, I imagined the Royal Palaces I had seen on television and in magazines; with their majestic rooms, each item placed exactly in the most stylish way, not a single thing out of place. With my 7 year old imagination, I’d pretend that her Highness Queen Elizabeth was coming to visit our house. I used Q-Tips and toothbrushes to clean each and every crevice of the items. I positioned and re-positioned things until they were exactly where they looked best, evenly spaced and symmetrical. The top of my dresser was perfect now, but how could I move on to the next one if the clothes were not folded perfectly in the drawers below? It was as if the items were screaming for attention: Fold us! Iron us! We are wrinkled and disorderly! We want to be perfect too! So I pulled everything out and started from the beginning; folding and placing them in a specific order. T-shirts went on one side, sweaters on the other. Socks in the top drawer, pants on the bottom. “Oh wait, the large ones should go on the bottom and the smaller ones on top. That doesn’t look right, they aren’t straight. Maybe sweaters should have their own drawer, there are too many t-shirts, and they’re getting all squished! There’s a spot on the mirror. The dust has resettled”. The Queen would not be happy! Many hours later, I was still cleaning that same piece of furniture. I was feeling tired and as I looked around I was discouraged at how much more work was to be done. My stomach twisted. My head felt tight. Exhausted, I gave up. My mom was upset. I had done nothing; the room was still a mess. I told myself I was lazy. Why couldn’t I get it all done? Why am I tired? What happened to the excitement? In my grade six class, I excelled at creative writing and public speaking. My handwriting however was messy and difficult to read. It was hard to write slowly, I had to get the words out fast before I forgot them! My mind was racing with ideas; they were going faster than I could write! I was told repeatedly to write neatly but it was so boring to take the time to form the letters perfectly. Halfway through the year, I opened my report card and looked down the rows of As and Bs when suddenly my world stopped and my heart sank. E. An “E” in handwriting. I was devastated. Perfection and Creativity were clashing with each other in my world. How could I be wildly creative and perfect at the same time!? I looked at the girl sitting next to me. Her writing was tiny and perfectly neat, slanted ever so perfectly to the right, each letter the exact same size. I thought it was so beautiful, especially in contrast to my chicken scratch. I resolved to write prettily like her. Over time, I began to hand in neat work and my teacher finally exclaimed, “I knew you could do it! Looks like you either do something perfect, or you just don’t do it at all, huh”? I literally felt the impact of those words in my body and they have stuck to me like cement ever since. Today, with 3 busy kids, a husband, two jobs, two businesses, 3 books, a radio show and whatever else I am excited to create, I am finding it impossible to please Her Royal Highness the Queen. As I expand my life and create the magic I know I am capable of, it becomes more and more clear that perfection is impossible, especially since I am unwilling to ask for help. Why? I can do all of it, I know I can! I flourish in environments that have systems. I am happy in organized environments and my perfectionist is kept pleased, I can even tell her to shut up once in a while and let it go. I have been allowing perfection to cripple me. My home is cluttered with items that do not have homes. They could have homes, my house is not small. I don’t give them homes because it takes time to think of the most perfect place for them all to go. So they stay out on the table, they stay in the shopping bags that I brought them home in. They get forgotten, misplaced and ignored. I beat myself up for allowing this to keep me frozen; for being unwilling to ask for help. I want perfection but have no idea how to create it and so chaos ensues in its place. My mind hurts and my body is unhappy. Perfection is killing my joy. In my effort and desire for perfection, I have created utter chaos with the judgement I have perpetrated on myself. I have been so unkind to me. I wonder what I could create if I was willing to be imperfect? I wonder what magic would be available to me if I quit the judgement. I can create this at the speed of space, I know I can; but judgement has to get out of the way to clear the space for magic. I am willing to be in the uncomfortable place of imperfection. I’m choosing peace. I’m choosing space. The items can scream all they want. The Queen can be angry. I’m choosing me.